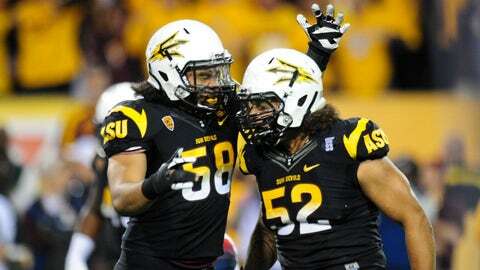 Todd Graham has an 18-8 record in two seasons at Arizona State. "There’s a lot of stuff out there, and I’m kind of getting tired of it," Graham said after Tuesday’s bowl practice. "We are committed to be here, to build a top-five national power. I’m tired of (the speculation). I’m not talking to anybody, I’m not going to talk to anybody. That’s what we’re doing. We’re focused on (building here). "We’re putting together the top recruiting class in the league and doing some great things, and obviously when you’re doing those things a lot of people don’t think of anything but negative things to say. But the reality of that is just absolutely false." "I hate even commenting on stuff like that, but I’m getting tired of it," Graham said. "We’re looking forward to taking this thing to the next level, and that’s top 10, top five in the country." "Coach Norvell is in the same boat," Graham said. "We’ll have a comment on that tomorrow. Our focus is to keep our staff together. We’re going to do that. We’re committed to building a top-five program in the country, so I don’t know what else you can say." 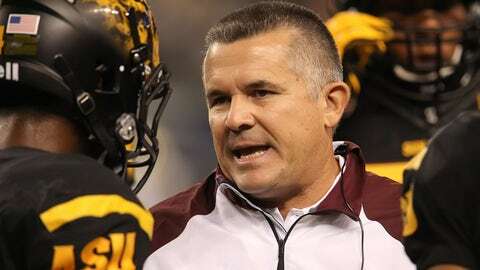 Graham said in a local radio interview Monday he is "fully confident" Norvell will remain at ASU and referenced ongoing contract discussions to retain the second-year coach.